Grilled or baked, this chicken is good for you and tastes delicious, too. Eat it alone or stuff it in a tortilla. 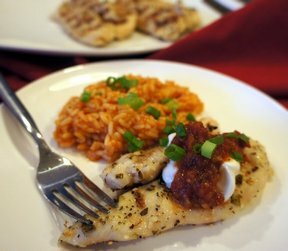 Place chicken breasts and taco seasoning in a resealable plastic bag; shake to coat well. Spray casserole dish with Pam. Place breasts in casserole. Bake 30 minutes at 375 degrees. Top with salsa 5 minutes before breasts are done. 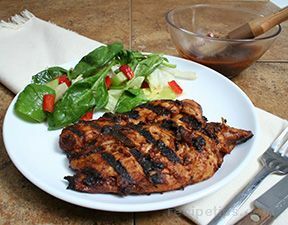 VARIATION: For grilling, grill seasoned chicken over medium-high heat until done. Top with salsa and sour cream to serve. "Delicious. 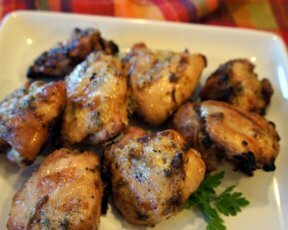 We used Chi Chi's taco seasoning since this is our favorite and we grilled them. The kids like them in tortillas with cheese and lettuce. I liked it just the way it was."